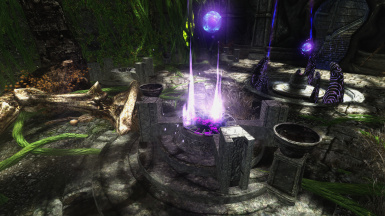 This mod adds a new form of magic (Anti-magic) to Skyrim, which can be acquired through the activation of a hidden shrine buried in the cliffs of the eastern Rift. Path of the Anti-Mage PT-BR A tradução só funciona se o mod original já estiver instalado. Thank you to Earrindo﻿ for the telvanni tower﻿ mushroom assets. Places a psionic sentry, granting the caster vision of the sentry and creatures around it through walls. When an actor draws close, they will light up red indicating that they are within range and the sentry can be detonated, enemies that are close to the sentry take health damage (based on alteration). The explosion will also dispel magic, reduce their magic resistance for 1 minute, and slow their speed for 30seconds. Up to 3 sentries can be placed at once. Hold the trigger key for more than 1 second to force detonation on all your sentries at once. -	No longer requires the target to not have detected you, allowing use in combat - this is balanced by the fact that the damage and debuffs do not stack now, so placing 3 ontop of each other and detonating on an enemy will still only damage them as if they were hit by one, however it will refresh the debuffs' duration. -	Still has a spell cost but will be ignored if you’re within an anti-magic zone allowing you to cast them even when in the anti-magic zone. -	Added new upgrade option Split, which causes the ranged beams to deal 25% damage to enemies near the target. -	Counters a casting opponent. Any aggressive spells are instead cast back on them, while beneficial spells are instead cast on you. This includes shouts. -	Having the max rank of cascading shadows will cause your silence spell to fear enemies that are 10 levels or less below you for 3 seconds. Now actually restores the correct percentage of your total health pool, was previously only restoring a percentage of your base health pool meaning not a whole lot at later levels. -	Purge: Remove the cleanse effect of your devour magic (removal of debuffs from friendlies) in exchange for a more vicious purging of enemies’ buffs. Will now deal damage equal to the amount healed by your devour magic to enemies who are affected by it, as well as slow their movement by 30% for 10 seconds. 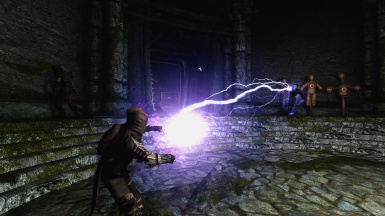 Increase your chance to absorb spells per charge for magicka (like atronach stone) instead of magicka regeneration. 1.5.4: Fixes an issue regarding the shine worldspace resetting. It should no longer reset. Hopefully this will also fix the ctds some people are having upon returning, though most likely not in their currently ctd'ing savegame. - Visuals of sheathed psi-blades changed. Instead of the drifting smoke, now cracklingy energy. Less obtrusive. 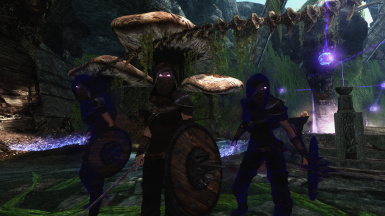 - Shadow Step can now allow you to blink behind npcs. Tap the hotkey for the regular result, or instead hold slightly longer before releasing to instead blink behind an npc in your crosshair. This does have a max range. - Fixed issue with psiblades not giving any alteration skill when using. - Fixed some other small typos. ·Upgrade shrine: This will appear after yourfirst rank in shadow mastery (second unlocked shrine) right by the same shrine. Activating this will allow you to upgrade certain abilities with various effects, changing or improving the way they work. Currently there are only five spells that can be upgraded, and they have varying numbers of upgrades available (More to come in future updates probably). 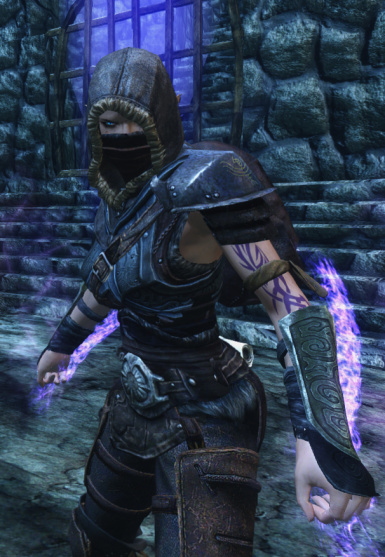 These upgrades will cost daedra hearts, and can be swapped or removed entirely. · Hotkey menu! When you get your first rank of Shadow Mastery (second unlocked shrine) you will be given a hotkey power spell, allowing you to set and change hotkeys for the various abilities that need them. · Alternative way of paying for shrines through a new item called Heart of Corruption. 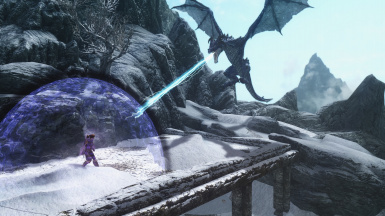 This is an alternative to having to spend perk points at the shrine, however they are not the easiest to obtain, you will need to figure that out for yourself (hint, explore inside the room with the dragon). 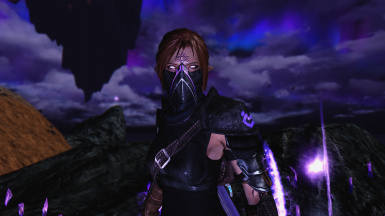 · Added a dark horror that can be summoned somewhere in the northern reaches of skyrim, who’s heart is black as night. · Mirror Image is now a lot better in the way it functions, images should appear immediately at your side, already fully geared in whatever you are wearing. 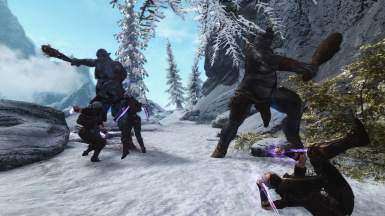 They will also swap to appropriate weapons to match you; melee weapon if you’re wielding melee, bow if you’re wielding a ranged weapon or a spell. They will also change gear dynamically as you do. · Detect magic now renamed to Occulent Sight, this is no longer a power but instead a hotkey activated ability gained from shadow mastery. 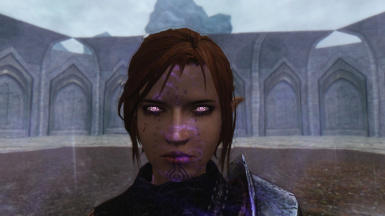 Activating it will make your characters’ eyes glow ominously, allowing you to see mages, vampire and daedra through walls. It’s a permanent, toggleable ability, and while active there is another hotkey that you can set to activate ‘detect magical items’, every 30seconds. · Anti-magic zone now no longer drains more magicka if you have it, nor does it increase in size based on your magicka. Instead it can be upgraded to double the size. · Many of the abilities with values, such as the defensive ward from psionic blade and their damage, or damage from psionic sentry now scale with your alteration skill. Psionic blade beams adjusted and changed visuals. They will also now do a minor stagger on enemies on the first impact, however that enemy will have to not be hit again by a beam for 6 seconds for it to be vulnerable to a stagger from the beams again. Mirror Image – Create two illusions of yourself; copying all your currently worn gear as well. These will be equipped with ‘fake’ Psionic Blades, and will follow you using a package that makes them stay on either of your flanks. Lasting 30 seconds, they will engage enemies and deal small amounts of damage, they are also not very tough, use them as a distraction! Recasting this spell will destroy existing images. Psionic Sentry – allows you to place down a small magical sentry wherever you’re looking within 20ft. This sentry will reveal nearby enemies within a small area around it, using detect creature magic. The sentry and those it reveals will be visible to you through walls. The sentry will detect ALL creatures, be them undead, beast, daedra etc. 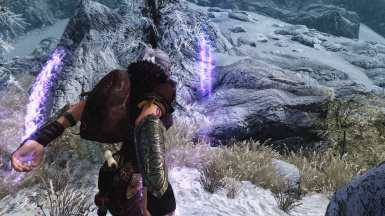 After casting this spell you will be equipped with a ‘trigger’ spell, this will also be in your spellbook whilst a sentry exists, cast this and the sentry will detonate; dispelling magic, dealing a large amount of health and magicka damage, as well as giving you a dark charge if at least one enemy was successfully hit. However, in order for the sentry’s damage to effectively pierce your enemies’ minds, you must be undetected by the enemies that are caught in the explosion. (Example/hint: Place one down ahead of time and lure enemies to it by making noise) Only one sentry can be placed at a time. 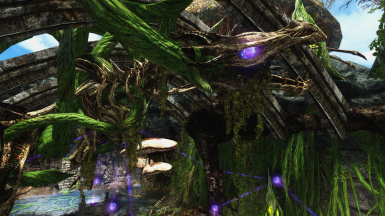 - No more perk tree; The perks and spells are now acquiredat the Serathi Shrine in the new area. 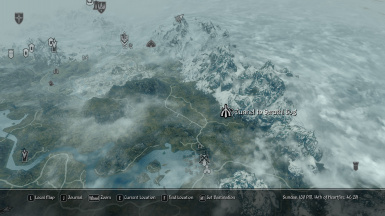 - The shrine is located in the Rift, along the eastern edge. It will be visible on the map and able to be fast travelled to. From there you can enter and make your way to the shrine, you will have to work out how to activate it. - Ignite Magicka now burns less magicka, found it was far too common to 1 shot mages, as they’d usually have far more mana than health… especially high level ones. Now progresses 20%/30%/40%/50%, and dealing 150% of that magicka burned as damage. - Ignite magicka and similar magicka burn effects now ‘dispel’ silence. This allows you to not be locked off from using those abilities against Silenced targets, as well as making the perk to increase the duration of silence to not be sometimes negative. Also allows you to use silence more strategically by silencing a caster before they can use any magicka up and then getting much more magicka burn damage in. - Anti-magic Zone can now be re-cast during its’ own duration. This will remove the previous zone. This will allow you to move it when you want instead of having to wait for the old one to fade. - Shadowstep is now much smoother, using different script functions to move the player. Still similar but more of an incredibly fast ‘dash’ now. Due to this change, its’ now possible to use it to extend your horizontal distance while mid-air as well. In addition, now when you toggle ‘shadow dancer’ on to activate shadowstepping, hold which key you would like to bind to the shadow-step key as you cast it. 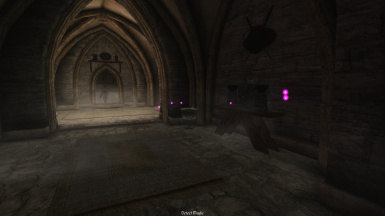 - Detect Magic shows more clearly where objects and enemies are. 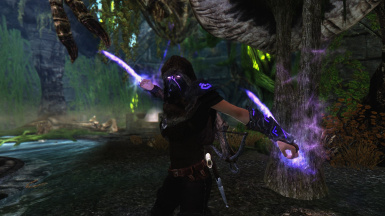 However, this spell no longer shows undead (though still vampires, since they are of daedric origin), simply enemies with more than 150 magicka or spells equipped. - Anti-magic weave now renamed to Psionic Blades will now fire beams that stop on their first target. However, they have a 6 foot ‘explosion’ now instead of piercing through all enemies. The blades themselves have had no change apart from visual and sfx. - Dark charges now increase magic resistance by 5%/10%/15% per stack instead of magicka regeneration, they still increase total magicka. They also have a ‘shield’ like visual over the player now, which amplifies in vibrancy as you get more stacks… this should help with determining when you have them and how many. - Removed Anti-magic shell spell and magicka sap, neither I felt fit in the mod very well anymore. Magicka sap was rarely useful and anti-magic shell was, while powerful, not very interesting. 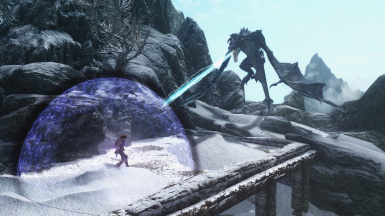 - the Anti-magic Zone Sphere now physically blocks magical projectiles like a ward; this means you cannot magical projeciles out either, otherwise still behaves the same. - Anti-magic zone sphere visual changed, using a more shield-like texture which can be better seen from inside of it. Made some changes to Detect magic, now finds enchanted items and containers holding enchanted items. Enhance Weapon - Ignite Magicka should grant xp now when cast. Fixed a bug with devour magic where the perk properties had been cleared from the script, leading to errors in papyrus that could cause ctds when casting it. Thank you to those who have sent me donations, know that I very much appreciate it and it is fueling my motivation to keep working on this mod and future mods I have planned. Update: For those wondering the comments and bugs sections have been disabled as I have not been active in the community and not actively working on this mod currently. I will reopen the comments/bugs sections when I have time to moderate, address and test issues and bugs that may remain. Until then, apologies for any issues you may come across. Thank you for your understanding. 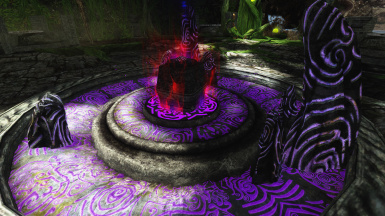 Places a psionic sentry, granting the caster vision of thesentry and creatures around it through walls. When an actor draws close, they will light up red indicating that they are within range and the sentry can be detonated, enemies that are close to the sentry take health damage (based on alteration). The explosion will also dispels magic, reduce their magic resistance for 1 minute, and slow their speed for 30seconds. Up to 3 sentries can be placed at once. Hold the trigger key for more than 1 second to force detonation on all your sentries at once. - Added new upgrade option Split, which causes the ranged beams to deal 25% damage to enemiesnear the target. on you. This includes shouts. a percentage of your base health poolmeaning not a whole lot at later levels. movement by 30% for 10 seconds. 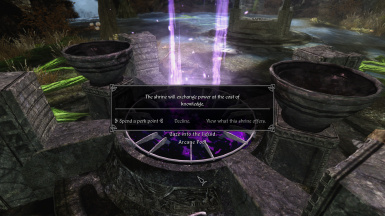 Increase your chance to absorb spells per charge for magicka(like atronach stone) instead of magicka regeneration. Q: Where can I get that armor? A: Currently that armor is incomplete for all races/sexes, therefore it is kept out of current releases. Q: Will you release these spells on their own? A: Unlikely I'm afraid, it would take quite a bit of work to detatch them from the current progression setup. A: This mod is mostly where I'd consider it complete, however I am always adding things. Future updates will involve more adventure-type elements as opposed to spells though. I am also working on a new lands mod set in and around the Serathi Bog featured in this mod, I plan to have it link to the small chunk you visit in this mod. However this is far off and quite an endeavour to do solo. Q: Not a fan of (insert visual or way mechanic handles), can you change it? A: Probably not since there will always be people who dislike something, however if you have a suggestion leave a comment, if I like it I may implement it later. I do plan to have alternate visuals eventually to things like the Psionic Blades. A: No, sorry. But if you have the know-how in doing it pm me and we can work something out. A: Check out Neithteam warpaints here on the nexus. A HUGE Thanks to Brodual﻿ for the comprehensive spotlight of my mod. "There are several ways to describe this individual. Slayer of mages, sellsword, assassin of the wicked, the bane of vampires, even kinslayer applies to this man or woman. You see, to effectively hunt mages, you must become one. Indeed it is a cruel irony, to destroy that which you hate you must embrace it. Mage Hunters are not noble, nor are they sadistic. Some sell their expertise to the highest bidder, some live by a code of honor. They hunt those that would sacrifice their mortality or morals to obtain power over others. Be them vampires, hagravens, briarhearts or rogue mages. With blade and spell, they purge the land of the wretched, no matter the cost to themselves." - An old, crippled scholar. 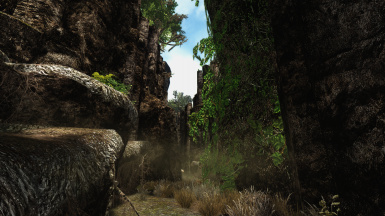 Travel to and explore a small part of a hidden land known as the Serathi Boglands hidden in the mountains between the eastern rift and morrowind. Discover and activate a shrine, granting you progressive access to the perks. The only thing you must exchange is your experience (perk points). The small amount of this area you gain access to is relatively desolate of life, however do not come unprepared, expect a fight. 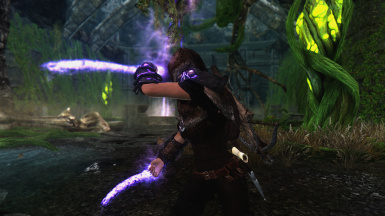 I highly suggest getting one of the mods that allow you to block whilst dual-wielding to use with this mod, as one of the spells equips you with dual-wielded anti-magic weapons and blocking with them will enable a ward. Thank you to Hirostormwolf for the video of my mod, however it is now outdated. Wombburn Rank 1 - Grants you the Mark of Shadow, stunting your magicka regeneration by 55% but increasing your resistance to all magic by 20%. Wombburn Rank 2 - Delve further into the shadow, stunting your magicka regeneration by 5% but increasing your resistance to all magic by 5%. Wombburn Rank 3 - Delve further into the shadow, stunting your magicka regeneration by 5% but increasing your resistance to all magic by 5% and grants you the Darkcaster ability, which upon being hit by a spell, stores the energy as bonus magicka and magicka regeneration or use it to heal. 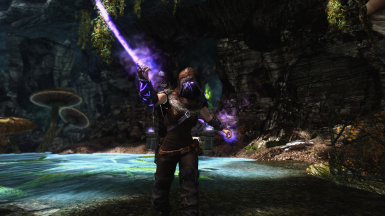 Shadow Mastery Rank 1 - Grants you two Anti-mage abilities; Occulent Sight, and Psionic Blades. Shadow Mastery Rank 2 - Grants you two more Anti-magical abilities; Silence, and Magic Biter weapon. Shadow Mastery Rank 3 - Grants you two Anti-mage abilities; Ignite Magicka, and Devour Magic. Shadow Mastery Rank 4 - Grants you two Anti-mage abilities; Spell Steal, and Shadow Step. Gifts of the Void Rank 1 - Grants you the Essence Font ability to temporarily transfer a portion of your Magicka into a target. Gifts of the Void Rank 2 -Grants you the Void Shatter ability; when cast at an enemy, consumes your Dark Charges and deals damage based on how much magicka they are missing from their total. Gifts of the Void Rank 3 - Increases the magicka transferred with Essence Font by 20%. Also allows you to use a weaker Void Shatter without any dark charges. Cascading Shadows Rank 1 - Reduces the cost of Anti-Magic Zone by 30%. Also increases the duration of Silence to 7 seconds. Cascading Shadows Rank 2 - Grants you the Mirror Image Spell and increases the duration of Silence to 10 seconds. In addition, silence will now cause fear on enemies that are 10 levels or lower than you for 3 seconds. Psionic Blades - Form your magicka into blades along your arms that cut into your enemies' mind as much as their flesh. The blades will burn your enemies' magicka, and allow warding for up to 50 pts of damage when blocking (increased with your alteration skill) The blades deal damage based on your alteration skill x2. Also allows you to project the energy as an energy wave when power-attacking. This spell must be dual-wielded, and will be dispelled if you equip something in either hand. - It also takes 30 of your maximum magicka to maintain the spell now. Anti-Magic Zone - Creates a nullified zone around the caster, which makes all who are within it's bounds almost impervious all forms of magic. The bounds of the sphere now block incoming and outgoing magical projectiles. Casting is near impossible within it's radius, and magicka is greatly reduced. Dark Mending - Consumes your Dark Charge granted by Dark Caster to heal you. First charge is 20%, second 40% and third is 60% of your total health. Devour Magic - Devours minor magic effects from the target to restore health. If the target is an enemy then the spell will devour beneficial magic. If the target is neutral or friendly, the spell instead devours negative effects. Enhance Weapon - Ignite Magicka - Enchants your weapon with "Ignite Magicka" properties, burning 5% of the targets magicka and dealing 142% of the burned magicka as damage. Essence Font - Transfer a portion of your magicka capacity to the target, After 10 seconds or if the target dies, the magicka will be restored. Ignite Magicka - Ignite 50% of the magicka of an enemy, dealing 150% of the magicka burned as damage. The magicka burned is increased by 10% per perk rank of Mage Ire. Shadow Dancer - Enables or disables your use of Shadow Step. Tapping the assigned hotkey, Shadow Step allows you to blink roughly 3 feet in any direction, but not through obstructions. Holding the hotkey slightly longer before release will instead lets you blink behind an enemy silently if they are in your crosshair and within range. Silence - Silence an enemy, temporarily cutting off their magicka supply and interrupting their current spell. Any magicka-burn effects will dispel Silence. 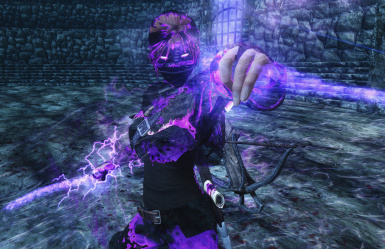 Void Shatter - Consumes your Dark Charge and burns an enemy for magicka missing from their total capacity. Each level of Dark Charge multiplies the damage by +1. 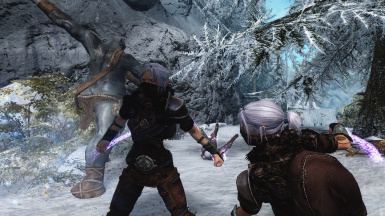 Mirror Image – Create two illusions of yourself; copying all your currently worn gear as well. These will be equipped with bound weapons based on what you are wielding, and will follow you using a package that makes them stay on either of your flanks. Lasting 30 seconds, they will engage enemies and deal small amounts of damage, they are also not very tough, use them as a distraction! Recasting this spell will destroy existing images. Psionic Sentry – Places a psionic sentry, granting the caster vision of the sentry and creatures around it through walls. When an actor draws close, they will light up red indicating that they are within range and the sentry can be detonated, enemies that are close to the sentry take health damage (based on alteration). The explosion will also dispels magic, reduce their magic resistance for 1 minute, and slow their speed for 30seconds. Up to 3 sentries can be placed at once. Hold the trigger key for more than 1 second to force detonation on all your sentries at once. Each of these upgrades will cost a daedra heart. They can be removed without cost, or swapped for another daedra heart. Blurred Form - Each of your landed melee strikes have a 20% chance of creating another mirror image. Maximum of 1 at a time. Refraction - The ward when blocking will now deflect magical projectiles back at their casters. Meld - When sneaking and stationary with psionic blades equipped, turn invisible. Moving or standing up will break the invisibility, 6 second cooldown. While melded, using your left power attack will fire a Empowered Blast, which will pierce through multiple enemies dealing x2 the amount of damage of a regular Psionic beam, as well as lower their magic resist by half of your alteration skill and their damage resist by x4 of half your alteration skill. Using the empowered blast will cost 50 of your magicka and break meld, causing it to be on cooldown for 20 seconds instead of 6. Split - Your psi-beams will now split off of the target, dealing 25 percent damage to nearby enemies. Spell Steal - Revert back to the older version of the spell, stealing the opponents equipped spells for a time and equipping them to the mirrored hands/power slots. Stalwart Sentry - Reduce the number of sentries you can have at once to one. Whenever an enemy casts a spell within range and line of sight of the sentry, the sentry will fire a bolt of energy at the caster. Dealing damage to their health and stamina: The damage dealt is scaled with your alteration skill. Shadow Strike - For a brief moment during your forward Shadow Step, your next melee attack will afflict your opponent with shadow poison. Dark Surge - After shadow stepping in any direction, chance to gain a 25 percent boost to your movement speed for 12 second. Lingering Shade - After shadow stepping in any direction,chance to turn invisible for 3 seconds. This mod is mostly where I'd consider it complete, however I am always adding things. Future updates will involve more adventure-type elements as opposed to spells though. I am also working on a new lands mod set in and around the Serathi Bog featured in this mod, I plan to have it link to the small chunk you visit in this mod. However this is far off and quite an endeavour to do solo. This mod requires SKSE, the Dawnguard DLC, and the Dragonborn DLC. As of 1.0, should not be any incompatability issues as this mod no longer edits any vanilla settings. Drop the contents of the .zip into your data folder and check it in the skyrim launcher/mod loader of choice. Please ensure to check the readme. Unfortunately if you have any other version in your save game, there is no way to update without many problems. This update will require a fresh save or new game. I'd advise from removing this mod from a save it is baked into, but if you do then be sure to open the console with the tilde (`) key and type 'stopquest AM_WeaponSpellsHandlerQuest', 'AM_MirrorImageHandler' and 'AM_ShrineHandlerQuest' without the inverted hyphens. In addition, use the console to remove all the perks from your character, as not doing this will leave your character with some stats permanently altered. After that, simply remove the .esp and bsa file. Bethesda for making the game. PeterMartyr was instrumental in helping me get a complicated ability to work, thank you for your help! 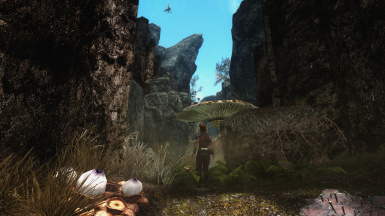 Thank you to Earrindo for the telvanni tower mushroom assets. Brodual﻿ for the comprehensive spotlight of my mod. Sometimes a shrine doesn't appear correctly, this from what I can tell is just due to too many objects being enabled at once. If you run into this you will have to reload and try again, it's very rare but has happened once or twice in testing. Sometimes the two handler quests don't start up correctly. If you are experiencing problems with Psionic blades effects not disappearing or mirror images not appearing or appearing naked. Do this in this order, first open the console and then type these lines, 1 at a time pressing enter after each. These are more quirks than bugs, as they are simply limitations. - Sometimes when casting Anti-Magic Weave too quickly you'll not equip the weapons, wait a second before casting it again and it should fix it. 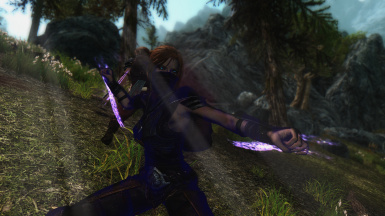 - Mods that force weapons out of your hands using a particular script function can sometimes mess up the Anti-Magic Weave also (the visual effect remains), but this can be fixed by casting it again. - Based on the way Shadow Step works at preventing you from going through walls, it may not always work when on awkward terrain/hilly terrain if it thinks it'll place you through the ground.